For a few years, my go-to beer for New Years Day was DeuS Brut des Flandres. Unfortunately they stopped selling it in Manitoba a few years ago due to low sales and most people didn't want to splurge $20 on a beer. I'm not a champagne or wine drinker but for some reason DeuS was the perfect beverage for the first day of the new year. 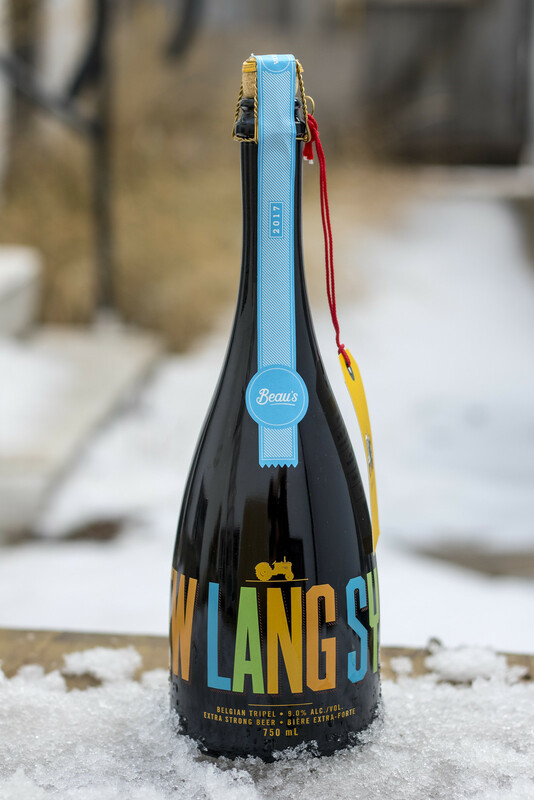 This year, Beau's brought out a beer called New Lang Syne, a Belgian tripel aged in wine barrels and served in a champagne-style bottle. I have severe anxiety with opening corks ever since I had a Unibroue Don de Dieu cork pop out at me and hit me just above the eye. New Lang Syne is definitely going to be an alternative to the traditional champagne for those who want a beer instead. I believe this might be the first tripel I've ever had from Beau's, and as you know.. I love Belgian styles! Appearance: Very carbonated at the beginning - as I pour it, the glass is mostly a light beige foam. The body itself is a cloudy, dark orange appearance. Reminiscent of your typical Belgian tripel for the most part. Aroma: Spicy hop notes are the first thing I get from this beer, it's a bit of a floral aroma with a light sourness to it. Notes of white wine, oak, straw, and a hint of dill. Taste: It starts off with a very sweet profile that I can only describe as your typical Belgian tripel sweetness. There's a good deal of booze burn in there, but it shouldn't be a surprise as it's a tripel and comes out at 9.0% ABV. There's a good deal of oak, a light white wine presence, and a liberal amount of hops that's giving off a rich floral and spicy flavour to the beer. Light notes of straw, it's not quite as carbonated as I expected because I was expecting a champagney beer more than a Belgian tripel, which I'm not sure why as it's labeled as a Belgian tripel in the first place.. but I absolutely love Belgian tripels so I'm not disappointed. Overall Thoughts: A stellar Belgian tripel with a good deal of hop presence and a mild oaky/white wine flavour to it. While it's not as champagney as I'd expect, I think that I'll still pop the cork on this beer on New Years Day. I have to say that visiting Beau's was probably one of the highlights of 2017, they have awesome people that run an awesome brewery! I hope your 2018 is a great one, Cheers!